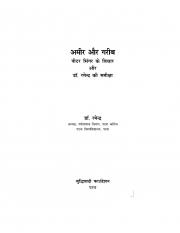 Description of "Amir aur Garib (eBook)"
The small Hindi book deals with the responsibility of the rich towards the poor. It is one of the topics discussed by Peter Singer in his famous book 'Practical Ethics'. The author, Dr. Ramendra, has explained Peter Singer's views on the subject in brief, and critically commented on them from an Indian perspective. In the process, he has come up with some concrete suggestions on removing poverty and inequality from the Indian society. Dr. Ramendra (full name "Ramendra Nath") is presently working as Associate Professor and Head of the Department of Philosophy at Patna College, Patna University, India; where he has been teaching for thirty years. He is a double gold medalist and double research degree holder from Patna University. His Ph. D was on "The Ethical Philosophy of Bertrand Russell" and his D. Lit. Was on "M. N. Roy's New Humanism and Materialism". Both these works have been published as books. Dr. Ramendra is the author of nearly thirty books and booklets in Hindi and English, including 'Why I am Not a Hindu', 'Is God Dead?' and 'The Myth of Unity of all Religions'. Besides, he has written hundreds of articles in newspapers, magazines and journals. His Hindi books include ' Andhwishvas ke Virudh', ' Kya Ishwar mar chuka hai?' and 'Main Buddhiwadi Kaise bana'. He has also written text-books in Hindi on Social-Political Philosophy and Philosophy of Religion. Reviews of "Amir aur Garib (eBook)"